Seremban, a town in Malaysia is famous for its siu pau . Seremban siu pau is a popular dim sum dish. The pau has a filling of barbecued pork wrapped in a pastry made up of an oil and water dough . The siew pau skin in this recipe is light and crispy with many flaky layers. However, don't look too closely at my pleating as I stink at it.
. Rub oil with flour until it looks like breadcrumbs.
. Dissolve sugar and syrup in water and add to the above. Mix together to form a smooth dough. Cover and rest for 15 mins.
. Divide dough into 9 pieces.
. Rub shortening gradually into the flour to form a soft dough. Cover to rest for 15 minutes. 3. Wrap oil dough into water dough (fig 1-2) and flatten (fig 3). 4. Roll out into a longish flat piece (fig 4). Roll up like a swiss roll (fig 5-6). 5. Turn 90deg (fig 7), and repeat (fig 8-9). 6. Press dough with palm and lightly roll out into a circle. 7. Place filling in the center (do not put too much filling in), wrap and pleat into a pau shape. Place on a greaseproof paper. 8. Brush pie with egg wash and bake at 190 degC for 20-25 minutes or until golden brown. 1. Do not put too much filling as it makes it difficult to pleat and will burst open during baking. 2. Do not let the filling come into contact with the sealing edge. 3. The filling consisted of 85g of char siu and 5 Tbsp of peas. See here for recipe. Lance, thank you for your compliment. i'm a malaysian student in melbourne, and surprisingly i can't find any place that sells siew pau like back home. i intend 2 make my own tho... how do you reckon the siew pau will turn out if i used puff pastry instead? 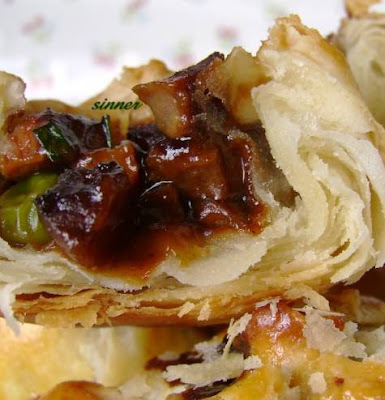 Cherie, puff pastry is very different in texture to chinese pastry. If substituting with puff pastry it will turn out tasting more like an ordinary puff char siu pie as opposed to a chinese siew pau. Why not try making the oil and water dough. It is quite easy and very manageable. The only part I found hard, was trying to make nice pleats. I'd love to try this recipe. I know shortening is important in making chinese flaky pastry, but I don't have it on hand. Do you think butter is an ok substitute or would it affect the texture too much? Otherwise I'd just have to wait until I get some shortening! Sorry, that was my comment and I forgot to leave a name. I've actually decided to go ahead and try the recipe with butter. I think the texture is acceptable (it was pretty nice) though it'd probably be better with shortening. I also have another question. After rolling the pastry swiss roll style as in Figure 9, I am supposed to turn the cylinder to stand upright before pressing with my palm to flatten it. Is that correct? Hope you can get shortening for your next trial. It does make a difference to the texture. It is extra crispy and flaky. After the final rolling as in fig 9, do not stand it up or you will loose all that lovely layering. Just press it to get a roundish shape. Hi can i ask what kind of shortening you use for the pastry? I live in NZ too but having hard time looking for suitable shortening to make Asian type pastries. If you click on the word 'shortening' in the list of ingredients, you will find a photo link to the 2 types I use. This is one of my favourite too!! Yum Yum!! I love siew Pau! !I can't wait till weekend now to try out some receipe! Tks Sinner ! Do I need to freeze the shortening first before I rub it into the flour? And is it fine if I use honey instead of golden syrup ? Hi Sinner, we just love the flaky texture ! I was quite worried initially about the dough. I only used up half of the sugar/honey mixture as the water dough was quite wet & sticky already. fyi.. I used plain flour in place of the all purpose flour, extra virgin olive cold pressed oil, manuka honey in place of the golden syrup. Do you use the weighing scale to weigh the 60g water ? How do you measure liquids in grams anyway ? The oil dough was smooth & soft like pillow. However, after the final rolling, when I flattened the dough to spoon in the filling, the edges are a bit hardened & I find it difficult to pleat the pau & close the opening. Luckily, the overall texture is still layered & flaky. The water is weighed with a weighing scale. Glad you liked the pau. Thanks for the feedback. could i ask how many you folded the dough? Teck, I don't quite understand your question. sorry.what i meant was, how many times did you fold the dough.i.e. roll into swiss roll, turn 90 degrees, roll out flat, roll into swiss roll, turn 90 degrees,roll out flat ...... how many times? 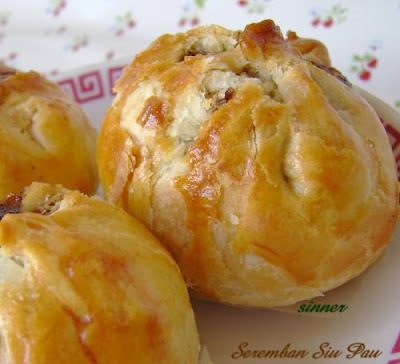 Hi sinner, just wanna let you know that i've made siew pau today and it sure does taste very very good :) Thanks for sharing! I've been looking for a detailed recipe for this pau. I really need to try this out. Thanx a lot for ur effort on putting the pics in too! If I do ever get the time to this it'll be my first time, so the pics would come in handy. tq! Hope you do find the time to try out the recipe. The end result is worth it. Hi, you have the best website and recipes!!! I have tried the Siew Pau & Taro Cake. I still need practise on the Siew pau pleating, the top seems to burst open and the gravy flows out. I made the Taro cake for Chinese New Year party and certainly gets the "Wow" compliments from my friends! Thank you so much for sharing your recipes, explaining and tips. By the way, I live in Howick, do you conduct cooking lessons??? Hi, me again.... I've just posted a comment earlier. My apologies, the yam cake mentioned earlier was actually the Crispy Yam Ring - "Fatt Putt". Very delicious indeed!!! Thank you once again. I am very thankful that I discovered your site.... everything is nice. Never seen this recipe before so I need clarification on the pastry prep before the filling is handled. Referring to figure # 8 & 9, after you completely rolled it up, you said repeat. Could you state precisely what would happened next. I want to confirm what I am thinking how to do it is correct. Thanks so much. I would appreciate your description. I would certainly be proud to do this recipe. Again, my sincere thanks to you. After I completely roll it up as in step 4 (fig 6), I then turn it 90deg, flatten into a longish flat piece (fig 8), and roll up (fig 9). In total from start to finish, the dough is rolled up twice like a swiss roll. Would love to hear your result after you make this. Thanks for your compliments. hi - do you have the measurements in cups instead of grams? Do a google for a conversion table and you should be able to do the conversion on-line. Hi Sinner! super nice siew pau!!! can i omit the golden syrup or izzit a must? If you can't get the golden syrup, I guess you have no choice. It is part of the recipe and golden syrup have that nice caramelised flavour. Can't really say if it is a must or not - skin might not be as nice though. Very glad to find your blog. Your Seremban Siew Pau looks great! I'll try to make it but have a question. In step 1, you said to wrap the oil dough into the water dough, is that means "to put the oil dough inside and the water dough outside?" Thanks for sharing so many delicious recipes. Yes, that is correct. Would love to hear your feedback. I did make my first batch of Siew Pau last week, but most of them burst open during baking and caused lots of smoke in my kitchen. So my fire alarm went off (lol). Anyway, the Siew Pau still tasted delicious and yummy, no regret of making them! My kids love them and begged me to make more! Thanks again for sharing this wonderful recipe! I have left a couple of comments on your site but this is just to say I am trying out- slowly- all the different recipes. they all look very good indeed! And find the instructions very clear. Thanks for dropping by. Happy browsing ! Thank you for this wonderful recipe. I live in the Midwest of the United States. It is hard to find Malaysia pastry. I tried many times to make this siew pau but without success. Finally I tried yours and it turned out as good as the one in Malaysia. Thanks again for sharing your recipe. So glad your siew pau turned out successfully. amazing . would ya tell me: should have to roll out new pastry each time for next felling? Thank Mei. Glad you like the bao. I am not too sure about sweet filling as we prefer 'salty' ones. Appreciate your feedback. Hi Sinner . Can golden syrup change to honey ? Hi Sinner. I actually live in Indonesia as I miss msia food so much. And seremban siew pow is one of them. I m going to try your siew pow recipe. But I can't find golden syrup here , also the shortening. .
Hi, thank you so much for your detailed recipe. I would like to know if the high protein flour makes a difference in the dough texture. Hi ...my skin did come out flaky and crispy the first time I baked. Second time round, it is a bit chewy as opposed to crispy like the first time. Is it because I reduced water dough a little just to make it smaller? I didn't reduce on the oily dough though. My water dough seems to be swimming in oil if I don't use them immediately. Am I doing something wrong? This is the first time I've come across your blog. I made these Siu Pau yesterday and I've regretted only making 9 of these!! I used your char siu filling recipe as well and... Who knew peanut butter would make the filling so good and creamy!! I loved it so much. I currently live in the UK and I found it so hard to get shortening here. So with a bit of research, I found that you can also use clarified butter or ghee. I used ghee yesterday and I've managed to achieve the flaky texture as well! Using butter or margarine, which has water in it will apparently lose the flaky texture as opposed to the 100% fat content of clarified butter or ghee. I just thought to share this with you and your readers as it was such a pain for me to find shortening. Anyway, I just want to thank you so much for sharing this recipe. I will definitely do it again and make a larger batch!